A double from man-of-the-match Daniel Williams on his return, and a goal from Ben Charlesworth, helped Shirebrook to a 3-0 win against Rossington in the Northern Coutnies East League’s League Cup. 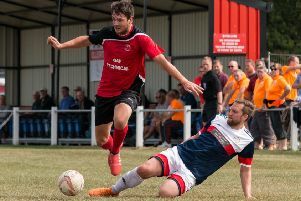 After an even start with both sides having chances to open the scoring but struggling to get shots on target, Shirebrook broke the deadlock in the 18th minute. When the ball was passed back the Rossington keeper was closed down by Brad Holmes. The pressure paid dividends as the keeper’s kick hit Holmes and was deflected into the path of Williams, who netted. Williams made it 2-0 in the 31st minute when Williams was played in down the left and smashed his shot across the keeper and into the bottom corner. Williams almost completed his hat- trick but saw his shot hit the post before half-time. Charlesworth and Williams both had chances to extend the advantage. Rossington hit back and struck the bar, while home keeper Levi Owen made saves. Shirebrook finished strongly. Carter Widdowson had two chances, one hitting the woodwork, before Charlesworth secured victory in the 81st minute.